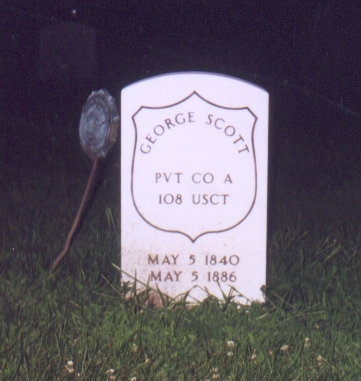 At Linwood Cemetery in Cedar Rapids, Iowa (Linn County) there lies buried a member of Co. A, 108th USCT named George W. Scott who enlisted on Aug. l8, 1864 at Elizabethtown, KY under the name of George Phillips, presumably the name he used while still a slave. After joining the army, he changed his name to George W. Scott, which is the name under which he lived out the remainder of his life. His pension records refer to him as "George Scott, aka George Phillips." He died May 5, 1886 at Cedar Rapids. His discharge date was March 21, 1866 at Vicksburg, MS. I have the pension records for Scott, as I was in the process of documenting all the Civil War soldiers buried in Linwood Cemetery in addition to seeing to the replacement of worn or broken grave stones, and the cleaning and resetting of other stones. Thirty-six stones have been replaced to date, I have cleaned 38 stones, and we have the remainder, approximately 100, to complete next spring. Scott's stone is one which needed to be replaced, yet I could find nothing on him. After receiving his pension files, the reason became clear: the two names. The National Park Service has Scott listed as Phillips on its website and this is the name under which he is listed on the African-American memorial plaque. I have notified the NPS about the name difference. I would like to see Scott included on your website listing, as he seems to have been "overlooked" through the confusion of names. There may be another African-American Civil War soldier buried at Linwood. His name is Richard Bass (possibly a Jr.) of Co. B, 8th LD HV Artillery, but I have yet to locate sufficient information to confirm this. He may have died Feb. 16, 1929 (his burial date is Feb. 18, 1929). I would like to include the name of Brad McGowan, a member of the Iowa Sons of Union Veterans of the Civil War, who has worked unceasingly in his efforts to help preserve the Civil War monuments in Iowa. He helped me gather information necessary to the replacement of the grave markers at Linwood Cemetery, then single-handedly removed and then replaced each of the 36 markers. As I mentioned, I cleaned 38 of the old markers myself this summer, finishing in October, and next spring and summer Brad intends organizing a group of SUVCW members to aid in the cleaning and resetting of the others. To date, I've located 190 Civil War soldiers at Linwood, and a volunteer at a local genealogical society has helped locate the obituaries of approximately half of those men. The record compiled contains military and biographical information on nearly every soldier, and grows almost daily as more information is uncovered. In addition, I have pension records, service files, and a few copies of photographs of some of the soldiers. The entire record is available to anyone interested. Again, your efforts are greatly appreciated!